On Wednesday (25 Mar. 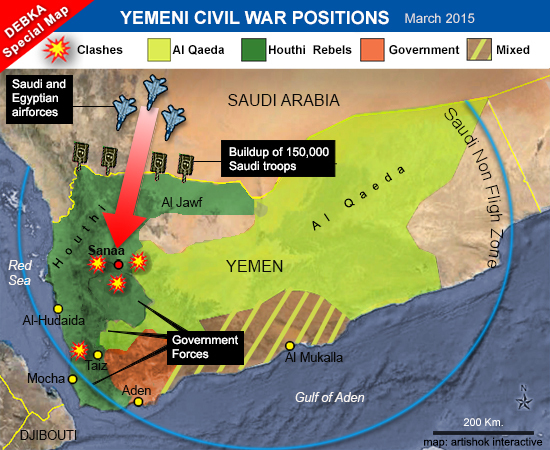 2015), Saudi Arabia announced a launch of a military operation against the Houthis, who currently control large parts of Yemen, including the capital Sanaa. Saudi attack is targeting Shiite Houthi rebels who are embroiled in a vicious civil war with the majority-Sunni-run Yemeni Government. Houthi militants have reportedly captured large stocks of weaponry from Yemen military sites. Saudi Arabia has reportedly deployed 100 fighter aircraft and 150,000 troops for the operation, Saudi allies have promised at least 100 fighter aircrafts more and U.S. logistical and intelligence support. The blatant invasion of Yemen’s sovereignty by the Saudi government comes against a backdrop of total silence on the part of international bodies, especially the United Nations. The world body has so far failed to show any reaction whatsoever to the violation of the sovereignty of one of its members by Riyadh. Yemen is the last example about the hypocrisy of Western powers especially if the case is compared to reactions related to Ukraine. Yemen has a population some 25 million and, located at the tip of the Arabian Peninsula , bordered by Saudi Arabia to the north, Oman to the east, Red Sea to the west and Gulf of Aden to the south. The Republic of Yemen was created in 1990 when North and South Yemen united. 53% of the Muslim population is Sunni and 47% is Shi’a. Among Yemen’s natural and cultural attractions are four World Heritage sites. Instability and large-scale displacement, as well as weak governance, corruption, resource depletion and poor infrastructure, have hindered development in the poorest country in the Middle East. Yemen is the poorest country in the Middle East. During last years in Yemen has been fighting between the state and the Houthis in the north; separatist unrest in the south; frequent attacks by al-Qaeda in the Arabian Peninsula (AQAP); and power struggles between tribal and military factions. By 2009, Saudi Arabia had joined the Yemeni army in attacking Saada – the Houthis’ stronghold – just across its southern border. In 2010 a joint Saudi-Yemeni military campaign was going on in the country’s war-weary north where Sana’a and Riyadh forces were engaged in a fierce fighting against the Houthi fighters. The Houthis, who accused the Sunni-dominated Sana’a government of discrimination and repression against Yemen’s Shia minority, were the target of the army’s off and on attacks before the central government launched an all-out fighting against them in early August 2010. Same time Yemen’s southern provinces came the scene of U.S. air strikes which Washington claims to be aimed at uprooting an al-Qaeda cell operative in the Persian Gulf state. The political crisis in Yemen started in 2011 when Ali Abdullah Saleh, who ruled the country since 1978, finally signed away his presidency in favor of his Vice President Abd al-Rab Mansur al-Hadi, a fairly weak figure who lacked a significant support base, either in politics or the military. In August 2014, Houthi rebels swept down from their stronghold in the mountains, demanding economic and political reforms. In September, they seized key state installations in Sanaa. The militants forced the country’s President Abd Rabbuh Mansur Hadi and his government to resign and dissolved the parliament in the first weeks of 2015. Hadi was under house arrest in Sanaa before he fled to Aden in February, quickly disavowing his resignation. Now Yemen’s fugitive President Hadi has arrived in the Saudi capital, Riyadh. Yemen is home to what Western intelligence analysts consider to be the most dangerous franchise of al-Qaeda. 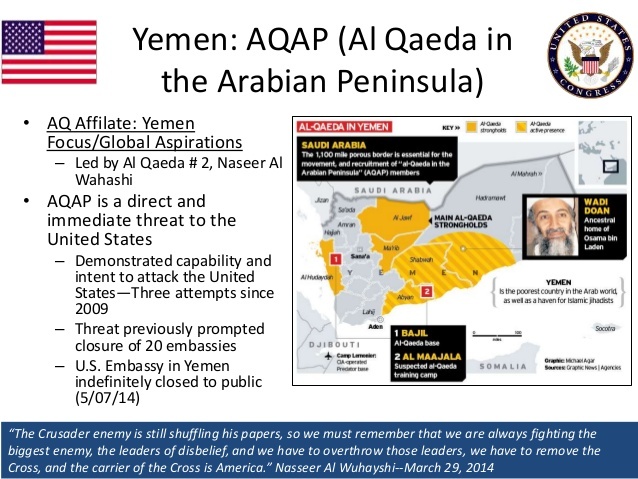 AQAP stands for al-Qaeda in the Arabian Peninsula, an alliance formed in 2009 between violent Yemeni and Saudi Islamists. In 2000 al-Qaeda suicide bombers rammed a boat full of explosives into a billion-dollar destroyer, the USS Cole, killing 17 sailors. Today the danger of AQAP is based to its international reach. For example it is claimed AQAP to be behind the attack on the offices of satirical magazine Charlie Hebdo in Paris. Earlier AQAP has successfully smuggled viable bombs onboard aircraft on international flights (e.g. cases of sc. “underpants bomber” and smuggled bombs hidden in printer ink toner cartridges on US-bound cargo planes). The Houthis are members of a rebel group, also known as Ansar Allah (Partisans of God), who adhere to a branch of Shia Islam known as Zaidism. Houthis are a large religious group comprising about one-third the population of Yemen and they ruled North Yemen under a system known as the imamate for almost 1,000 years until 1962. The Houthis are also benefiting from increasingly overt support from forces loyal to former President Ali Abdullah Saleh, who still has influence in the Yemeni military. Islamic State (IS), which set up a branch in Yemen in November and is also gaining ground in the country. For U.S. Yemen is important for two energy related issues: one is Yemen’s geopolitical location as one of the world’s most important oil transport routes and the other is undeveloped – some say one of the world’s largest – petroleum reserves in the territory. The U.S. Government Energy Information Agency states that “closure of the Bab el-Mandab could keep tankers from the Persian Gulf from reaching the Suez Canal/Sumed pipeline complex, diverting them around the southern tip of Africa. The Strait of Bab el-Mandab is a chokepoint between the horn of Africa and the Middle East, and a strategic link between the Mediterranean Sea and Indian Ocean.” In addition to its geopolitical position as a major global oil transit chokepoint, Yemen is reported to hold some of the world’s greatest untapped oil reserves. The United States quietly opened already in 2008 largely covert front against Al Qaeda in Yemen. Citing an unnamed former top CIA official, the New York Times wrote that then Central Intelligence Agency sent many field operatives with counterterrorism experience to the country. At the same time, some of the most secretive special operations commandos have begun training Yemeni security forces in counter-terrorism tactics, the report said. The Pentagon will be spending more than 70 million dollars over the next 18 months, and using teams of special forces, to train and equip Yemeni military, Interior Ministry and coast guard forces, more than doubling previous military aid levels, the paper noted. 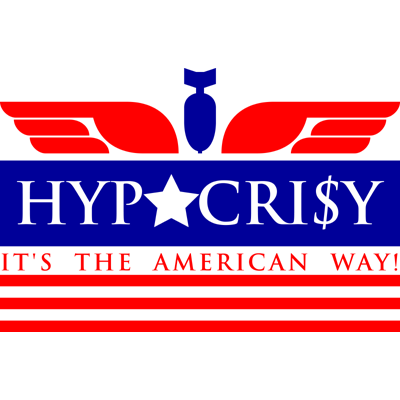 Without doubt, the military-industrial complex has a stake in expanding areas to be exploited for oil as well as protecting U.S. oil sources. This is good news to the weapons industry. There is similar U.S. involvement now in Yemen as it was earlier in Ukraine where various U.S. agencies had their role in Kiev’s coup d’etat. In Yemen e.g. USAID has funded a $3.58 million project to create a secession movement. Project was implemented mainly in Aden as south Yemen is strategically important for Western powers. The US embassy last month closed its operations in Sanaa after the Houthis took command of the capital, leading to a situation where two rival governments in the north and south are competing for power. In response to the deteriorating security situation, Saudi Arabia, Gulf Cooperation Council (GCC) members, and others will undertake military action to defend Saudi Arabia’s border and to protect Yemen’s legitimate government… The United States coordinates closely with Saudi Arabia and our GCC partners on issues related to their security and our shared interests. In support of GCC actions to defend against Houthi violence, President Obama has authorized the provision of logistical and intelligence support to GCC-led military operations. While U.S. forces are not taking direct military action in Yemen in support of this effort, we are establishing a Joint Planning Cell with Saudi Arabia to coordinate U.S. military and intelligence support. 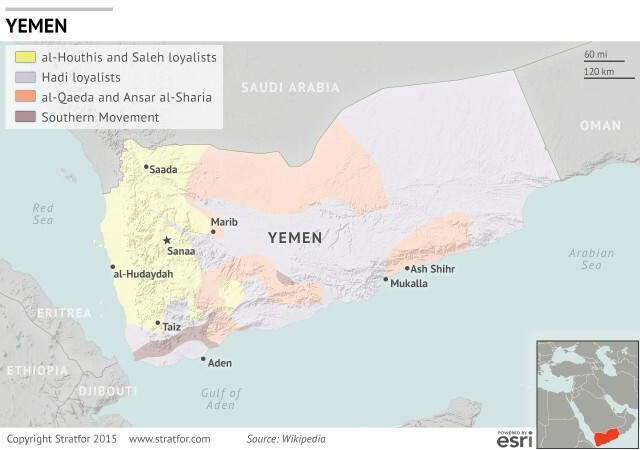 Yemen is a battleground between Shiite-led Iran and Sunni-led Saudi Arabia. Houthi sources also reported they have been promised a year’s supply of crude oil from Iran and a new power plant. Direct air service between Tehran and Sanaa began in February. Islamic Revolutionary Guard Corps (IRGC) experts are advising the Houthi forces. Against this background, the success of the Houthis is seen as a blow to Saudi interests (and for that matter, American interests) and a boost for Iran. The Saudis also fear the Iranians with Iraqi help may try to stoke tensions and violence in Bahrain next. 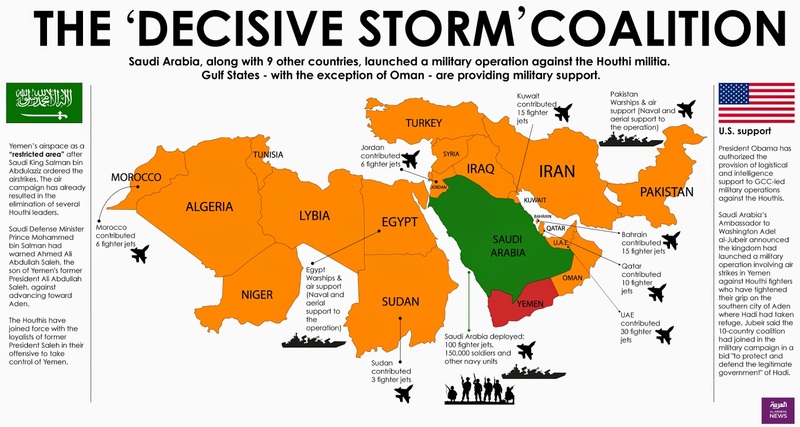 Summary: In the fact the Iran-Saudi Arabia proxy war is going on in Yemen. The irony now is that Yemen has went into a civil war pitting the Shia Houthis – suspected of being backed by Iran – against Sunni tribes backed by al-Qaeda and U.S. has in fact now forced to fight for al-Qaeda. If that doesn’t seem absurd enough so in Iraq, U.S. is helping Iranian-backed Shiite paramilitaries fight the Islamic State but in Yemen, U.S. is helping the Saudis fight Iranian-backed paramilitaries. Same time U.S. is at final stage to make deal with Iran about their nuclear program much to chagrin Saudi Arabia, the main U.S. ally in Arab world. The foreign military intervention in Yemen is a clear-cut violation of international law, in particular of Article 2(4) of the United Nations Charter, which bans the use of force in relations between states. The unilateral action of Saudi Arabia and its allies is not in any way justified as act of “collective self-defence”. Instead it is interference in a civil war on the side of one party to the conflict, and it will make the domestic conflict even worse. From my perspective Yemen is last example about hypocrisy displayed By Western powers. When U.S. backed coup ousted President Yanukovych it was praised as victory of democracy over corrupt society. When corrupt President Hadi was ousted in Yemen so West still suooorts him and even Saudi-led bombing against the people. One can only imagine what kind of outcry had followed if Russia had started bombing campaign against Kiev. So in the world of double standards only politics, money and power matters as usual. According to Stroytransgaz, the 96.6 km (60 miles) Negotino-Klecovce gas pipeline will cross Macedonia from near the Greek border in the south up to the vicinity of the Serbian border in the north. 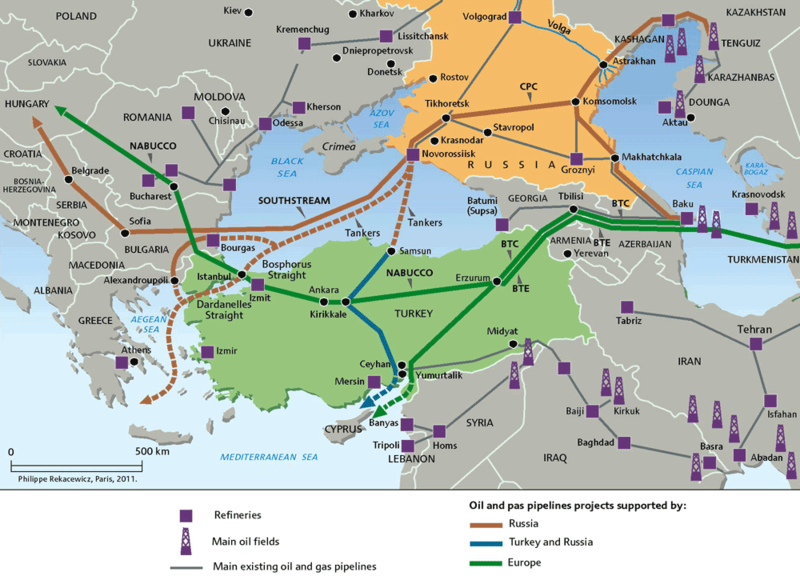 Stroytransgaz will build 61 km of the link by June 2016. At the moment, Macedonia receives gas from Russia via Bulgaria and Romania as part of the transit through Ukraine (pipe string N8). The existing pipeline has a capacity of 800 million cubic meters a year – not enough to satisfy the needs of the Balkans. The pipeline may be out of operation as early as 2019 when Russia plans to stop using this route, or, even earlier, in case of Ukraine’s further disintegration. Gasprom and its Turkish partners want to finish the construction as early as they can. Gazprom’s CEO Aleksey Miller said, «Our priorities – to study the route’s options in Turkey, to define the location of the landfall facilities, gas delivery points for Turkish consumers and border crossings between Turkey and Greece». There is an intriguing collision here. Nature and geography are the factors to facilitate Macedonia’s becoming the key transit country in the Balkans. There is an alternative route going through Bulgaria and Serbia. But Moscow does not see Bulgaria as a partner to trust. Serbia imports all the gas it consumes. Russia accounts for 95% of its supplies. Belgrade faces political problems. It has to prove itself as a reliable partner to become part of the emerging energy system in the Balkans. Turkish Stream has the same capacity as South Stream. It can carry up to 63 billion cubic metres (bcm) of gas annually to Europe with 16 billion remaining in Turkey and 47 billion going farther to the Balkans. It’s enough to satisfy all the requirements. The main obstacle is the gap between the Serbia’s ruling elite on the one hand, and the interests of Serbian people on the other. No matter Western and many Serbian media outlets have launched an anti-Russian and anti-Gasprom campaign, there is a growing understanding in Serbian society of the reasons South Stream was cancelled. According to a poll conducted in late 2014-early 2015, 39, 8% of Serbs believe the United States is behind the cancellation of South Stream while 20,2% put the blame of the European Union. Only 6, 5% believe that it was Russia’s fault. 2, 4% of respondents think that Bulgaria was responsible because it’s not fully independent while taking decisions on energy and other issues. Bulgaria mainly, and to lesser extent Serbia, failed to act on their own being too much subject to foreign influence. Today Turkey imports around 70% of oil and gas it needs, its consumer demand is to increase 40% by 2020. Turkey wants to become a key energy hub. It takes part in talks on all the projects under consideration related to new routes going to Europe, no matter some of them are subject to competition. The availability of resources defines energy geopolitics. It makes the Russia’s position be on solid footing. Of course, Macedonia presents some risks due to internal political instability and the emergence of Albanian factor. The West’s intention to frustrate the Russia’s plans is obvious. There are grounds to believe that the recent round of political confrontation in Skopie was incited by the West. The events have all the making of «color revolution» inspired from outside. But one way or another, Serbia, Bulgaria and Macedonia have to think about their energy needs. Common reason makes them realize that close cooperation with Russia meets their interests. All planned and existing energy routes go to the region from the East, not from the West. Liquefied gas tankers from Qatar or Algeria don’t drop anchors Belgrade, Sophia or Skopie. 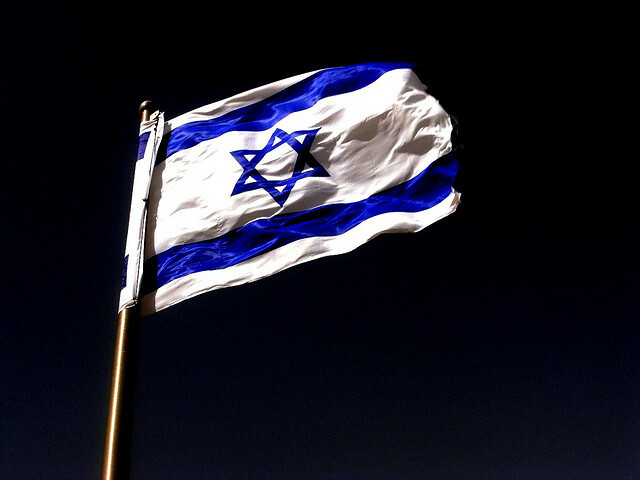 Israeli voters gave Prime Minister Benjamin Netanyahu a resounding victory in Tuesday’s [17th Mar. 2015] election, despite pre-election polls showing him trailing the Zionist Union. The Zionist Union won close to the total it had been predicted by pollsters, and its 24 seats is more that Labour and Livni’s Hatnua won separately in 2013 (21). However PM Netanyahu’s Likud secured a decisive victory with 30 Knesset seats. Polls before election as well even exit polls differed vastly from the final figures. Sure the Israeli left did better than it has done in almost a generation but it was not enough. One part of leftist campaign was sc V15 – Victory in 2015 – project of the One Voice group. The project was accused of being operated and funded by anti-right groups abroad, which gave the group money to set up an organization that would cause Netanyahu to lose. The group denied that it was representing foreign agents, and the Likud sought to have the group shut down, unsuccessfully. Netanyahu picked a fight with a sitting U.S. president and declared there will never be a Palestinian State. The Prime Minister’s renunciation of the two-state solution and his boast that he will continue building in east Jerusalem were signs of his new hard-line approach. Netanyahu was able to surge in the last few days, following even a racist campaign that warned right-wing voters of a “left-wing government backed by the Arabs.” The warnings worked and moved 150,000 votes from other right-wing parties into the Likud column in the campaign’s final days which pushed him from 19 percent in the polls before the election to 23 percent on election night and cemented his position as the leader of Israel’s right wing. Other right-wing parties were losers – Bennett and the settlers dropped to eight seats in the exit polls from 12, Liberman dropped five, and the far-right Yahad party didn’t even make it in. As result Israel’s Prime Minister should be able to put together a ruling coalition of center-right parties that is more manageable than his last majority. PM Netanyahu’s nasty campaign alienated major parts of the public in Israel and abroad he put himself in a diplomatic corner e.g with U.S. and EU. The fact that Netanyahu openly campaigned on his opposition to Palestinian statehood means that now he is backed by a majority of Jewish/Israeli voters. Related to U.S PM Netanyahu will need to decide what to do if and when a deal about Iran does go through. According to Israel’s Central Election Committee, out of a total of 5,878,362 eligible voters 4,253,336 participated in Tuesday’s election or 72.3 percent of the electorate. The final election turnout was 4.6% higher than in the previous election and the highest since the 1999 elections, which saw a 78.7% turnout. Furthermore, the electoral threshold for any party to participate in the next Knesset was 136,808 votes with 33,482 votes to equal one mandate. The election resulted in a record number of women (28) being elected to the Knesset. President Reuven Rivlin tried before elections to facilitate a Likud/Zionist Union coalition government, however both parties have ruled this option out. There is in theory also a possibility to centre-left government with ZU, Arab list, Yair Lapid’s Yesh Atid and Moshe Kahlon’s centrist party. The winner isn’t the party with the most votes, but the one that can unite several smaller parties together into a governing coalition. In 2009, Netanyahu became prime minister even though the Likud came in second on Election Day. However I think that now these alternatives are unrealistic. President Rivlin intends to begin meeting the heads of elected Knesset parties on Sunday [22nd Mar. 2015], to receive their recommendations over who should form the next government. This is the first stage in the coalition building process and will almost certainly result in Rivlin inviting Netanyahu to build a coalition. Netanyahu will then have an initial four-week period to complete the process. Netanyahu has already contacted Jewish Home leader Naftali Bennett, Yisrael Beitenu head Avigdor Lieberman, Shas chairman Aryeh Deri, United Torah Judaism’s Moshe Gafni and Ya’akov Litzman, plus Kulanu head Moshe Kahlon. A coalition including all of these parties would guarantee a 67 seat majority in the 120-seat Knesset. Widespread media speculation suggests that Kahlon will become Finance Minister and incumbent Moshe Ya’alon will remain Defence Minister. Naftali Bennett will be appointed either Foreign Minister or Justice Minister. Avigdor Lieberman wants a senior role, but his negotiation position is weak with his Yisrael Beitenu party having secured just 5 seats. Senior Likud MKs including Gilad Erdan and Yuval Steinitz will also expect to be rewarded with prestigious ministerial positions. Meanwhile, Shas leader Aryeh Deri looks likely to become Interior Minister, a job he has previously held, while United Torah Judaism may be rewarded with the health portfolio. Without any commitment to a two-state solution and Netanyahu’s boast that he will continue building in occupied east Jerusalem may increase pressure – not least from Europe – for moves towards sanctions against Israel. My forecast is that if centre-right wing government continues after elections so nothing will change in peace process, the same is if there will be Likud/Zionist Union coalition government. If centre-left government will be established there might be a slight chance to go forward. In this case there is no need to start everything from the beginning as Mrs. Livni was participating to long negotiations during Olmert’s time. If peace negotiations don’t start or they fail again so there always is another option : unilateral actions; e.g. Israel could annex main settlements from West-bank inside the security fence and return to negotiations about other than so solved border issue when both parties feel need to make a long term deal. Not so bad option anyway from my perspective. One key aspect with peace process is that historically Likud remains the only party to have withdrawn from Israeli territories – first from Sinai in 1982 under then-prime minister Menachem Begin as part of the peace agreement with Egypt and in 2005, under then-prime minister Ariel Sharon, it unilaterally withdrew from the Gaza Strip. The optimist side of me would like to compare situation now with situation ten years ago. Ariel Sharon was war hero know about his hawkish attitude and his position was strong. After this election PM Netanyahu has now a strong mandate and he could make similar brave decisions and broke deal with Palestinian Authority based two-state solution and -67 armistice line – with land swaps to annex main settlements behind security fence to Israel. Remains to be seen if this optimism will be Utopian – I hope not. 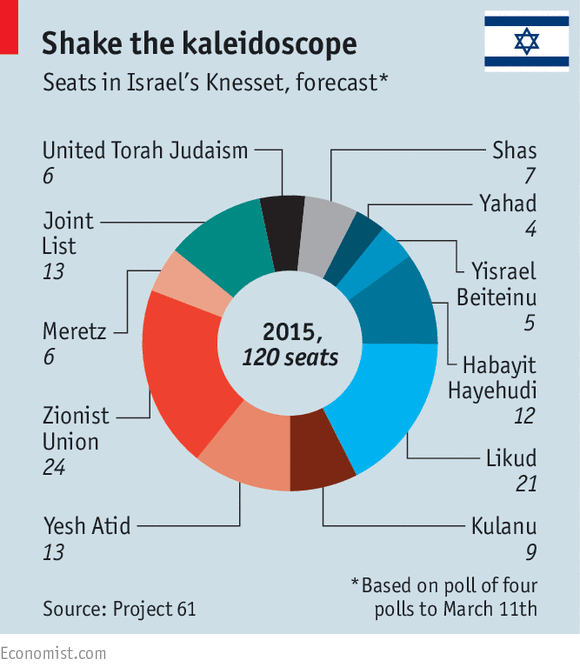 On 17th March will Israel have voting for new Knesset and it seems to be creating very interesting scenarios for future. 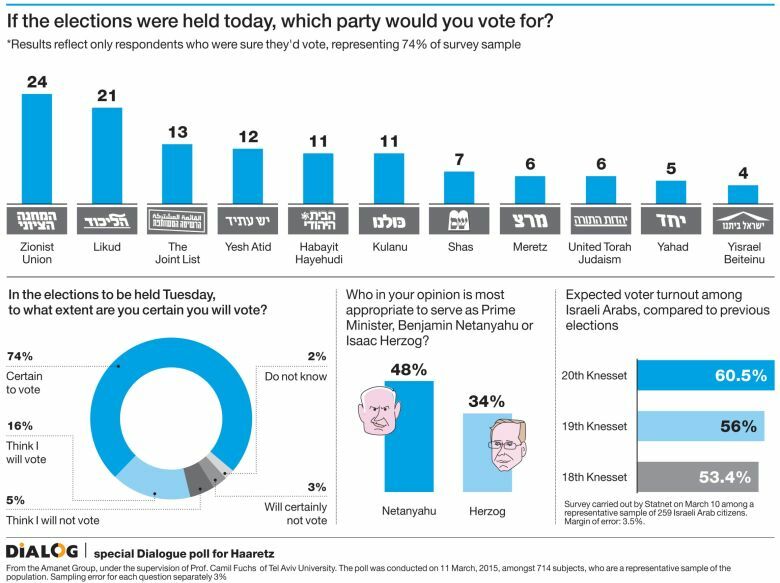 Last polls show that now there is a real possibility to replace PM Netanyahu with centre-left option. Centre-right Likud is losing elections to Zionist Union which is a new combination of Isaac Herzog’s Labor party and Tzipi Livni’s Hatnuah. When PM Netanyahu made decision about early elections he or most analysts hardly were supposing so big change. It remains to see if possible win of Zionist Union is enough for centre-left led government which could boost Israeli-Palestinian peace process to new track. According to the last polls Zionist Union is getting 24-26 Member of Knesset while the ruling Likud only 21 or less and its right-wing ally Habayit Hayehud 11-12 MKs. A new center-right party – Kulany – with its popular leader, ex-Likud minister Moshe Kahlon might get nine MKs and the secular populist party Yesh Atid 12-13 seats..
Yisrael Beiteinu is now in the danger zone as FM Avigdor Lieberman’s party barely crosses the electoral threshold and will get only four-five seats if any. By contrast, both Meretz and Yahad have improved their positions, exceeding the electoral threshold and getting five-six seats. 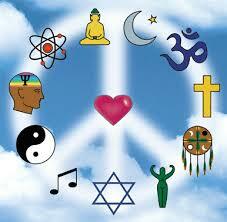 The religious parties tend to be keeping their positions. Following the raising of the electoral threshold the main Arab parties – Balad, Hadash, the southern branch of the Islamic Movement, Ta’al and the United Arab List – agreed to run on the same list in the election, this Joint List, could increase turnout amongst Arab voters to 56%, 10% higher than in the 2013 elections. However, the more hardline northern branch of the Islamic Movement opted to boycott the elections, along the Abnaa el-Balad (Sons of the Village) movement. One interesting detail is that Kadima party is not running in this election at all. 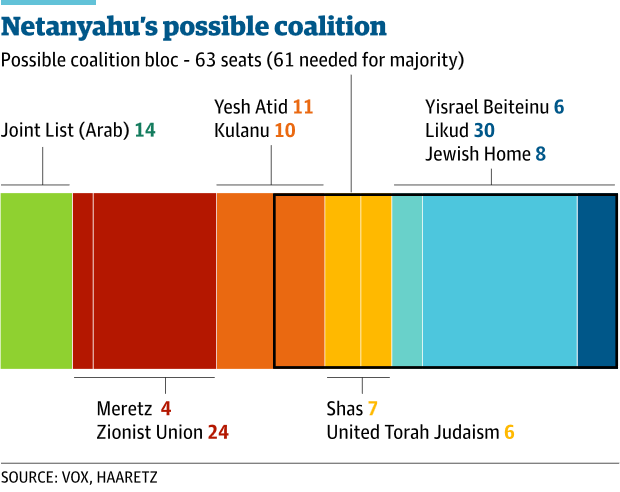 One should make note that the margin of error in Israeli polls is quite high – some four per cent up or down. However if the winner is ZU so there is a huge challenge to form new government – actually putting together a coalition will be very difficult. Herzog would have to persuade parties like Meretz and Yisrael Beiteinu to sit together, and convince one or more Haredi parties to cooperate with Yesh Atid’s Yair Lapid. Arab parties probably prefer centre-left government more than other alternatives. As sources I have used e.g following election pages: JStreet, Haaretz, Bicom. Solving Israeli-Palestinian conflict is not on top of the agenda in this elections . However the new government will have its impact to peace process to one way or other. In infograph below there is positions of parties related to main issues of Israeli-Palestianian conflict. 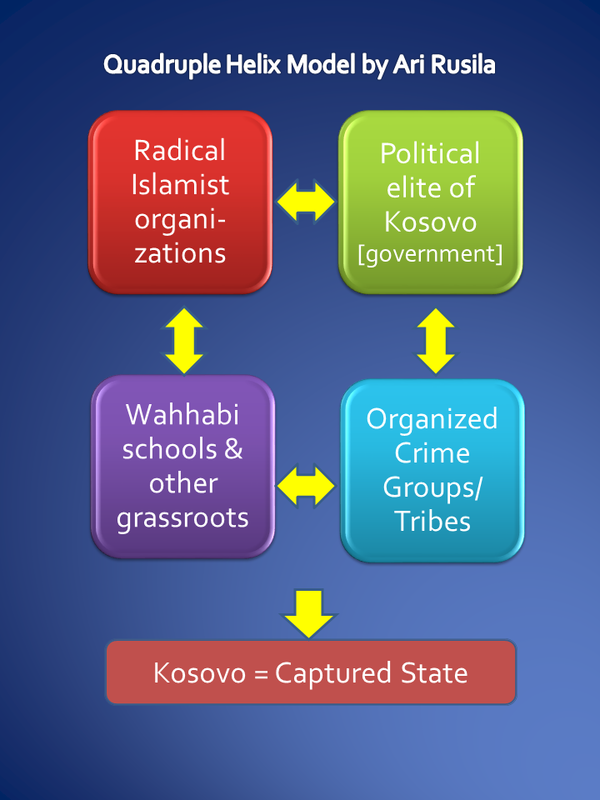 Credits for the figure belong to MEMO –Middle East Monitorille. Infograph can be downloaded from here! My forecast is that if Zionist Union can form the new government there will be improvement with Israeli-Palestinian peace process based on two-state solution. If Herzog and Netanyahu create unlikely joint government so probably nothing new with this issue will be invented. If the new government is right-wing dominated so then there is possibility that Israel will carry out some unilateral actions such as officially annex main settlements to Israel. In 1993, under the direction of Yasser Arafat’s deputy, Abu Mazen (Mahmoud Abbas) held secret negotiations with Israel’s then–Deputy Foreign Minister, Yossi Beilin. The negotiations gave birth to the “Beilin–Abu Mazen Understandings,” (or Beilin-Abu Mazen plan or Beilin-Abu Mazen document) the first-ever draft of a final status agreement. Beilin had worked as a journalist and as a lecturer in political science before going into politics in the mid-80’s. He quickly established himself in the Labor Party’s Young Guard as a militant moderate and as an advocate of equal rights for Israel’s Arab minority and reconciliation with the Palestinians.Right at the beginning, Beilin went straight to Arafat (while he was still in Tunisia) to ask him to join in an effort to work out principles for a final agreement between Israel and the Palestinians. Arafat agreed and delegated the job to his closest advisor, Mahmoud Abbas, known also as Abu Mazen. From the democratic point of view Yossi Beilin’s action was questinable. Behind the backs of an elected prime minister (Yitzhak Rabin) and foreign minister (Shimon Peres), a deputy cabinet minister over a period of two years held fateful talks with the national enemy. The agreement was negotiated in secret in Oslo and Stockholm by a team of Palestinian and Israeli negotiators, under the supervision of Beilin for Israel, and of Abu Mazen (Mahmoud Abbas) for the Palestinian side and was finalized in October 1995. Yossi Beilin returned to get the approval of Prime Minister Rabin. However, by the time Beilin had returned to Israel, Yitshak Rabin had been assassinated by Yigal Amir. Shimon Peres was unwilling to go forward with the agreement, and likewise, apparently, Abu-Mazen was not able to find support for it on the Palestinian side. However, many of the ideas contained in this agreement were carried forward to other negotiations, and are reflected in draft agreements regarding refugee status and Jerusalem, as well as status of the settlements and the principle of territorial exchange. But when the document was leaked to the press, Abbas tried to distance himself from it and to minimize its importance. The document was never formally published and never adopted by the Israelis or the Palestinians. PLO officials disavowed its existence, but the proposal found its way into circulation. Although the proposal was never completely accepted, some of the ideas presented in it were thought to be good compromises in resolving certain issues in final status negotiations later on. Borders: Israel will withdraw to the 1967 armistige line/borders, except for certain territorial exchanges (land swaps). Israel would agree to the establishment of a Palestinian state on most of the West Bank and Gaza Strip. Jerusalem: Related to Jerusalem one Municipality would be maintained in the form of a Joint Higher Municipal Council, with two (Israeli and Palestinian) sub-municipalities. The Palestinian boroughs would be under Palestinian sovereignty; the Israeli boroughs under Israeli sovereignty. The Western part of the city, would be the capital of Israel, called “Yerushalayim”; the Arab Eastern part would be the capital of Palestine, called “al-Quds”. Refugees: Whereas the Israeli side acknowledges the moral and material suffering caused to the Palestinian people as a result of the war of 1947-1949. It further acknowledges the Palestinian refugees’ right of return to the Palestinian state and their right to compensation and rehabilitation for moral and material losses. In turn, the Palestinians would give up their right of return to Israel proper and instead encourage Palestinian refugees to settle in the new Palestinian state. In January 1997, Beilin and Michael Eitan, a Likud Member of Knesset, announced that they had arrived at a set of guiding principles for Israel’s negotiating position in the final status talks, quite similar to the reported details of the Beilin-Abu Mazen Plan. The Beilin-Eitan Agreement was released as the Likud-Labor consensus on a permanent agreement with the Palestinians. Neither the Likud nor Labor leadership has endorsed the Beilin-Eitan plan. At Camp David in 2000 Israel practically proposed the Beilin-Abu Mazen formula to the Palestinians. It was a little less on the settlements, a little more on Jerusalem. Afterward, in the months following Camp David, Israel went much further and proposed n enhanced version of the Beilin-Abu Mazen formula to the Palestinians. At Taba, Israel offered the Palestinians a super-enhanced version of Beilin-Abu Mazen, but even the super-enhanced version could not bring home the Palestinians. Beilin and Abu Mazen managed to produce what seemed to be the first solid evidence that the Israeli-Palestinian conflict is soluble. They had drawn up Documents solemnly declaring that no serious problem stood in the way of a peace treaty with the Palestinians – not Jerusalem, nor Jewish settlements in the territories, nor the Palestinian demand for a right of return for their refugees. The document shows what the real back channel work can achieve. The text below – as well in my document library – is unofficial, but is believed to be substantially correct. It is believed that in addition, there may have been informal letters exchanged concerning the status of Jerusalem and other matters that were not made public. “Beilin – Abu Mazen document” – Framework for the conclusion of a final status agreement between Israel the PLO – Non-UN document (31 October 1995). You are currently browsing the Conflicts by Ari Rusila blog archives for March, 2015.